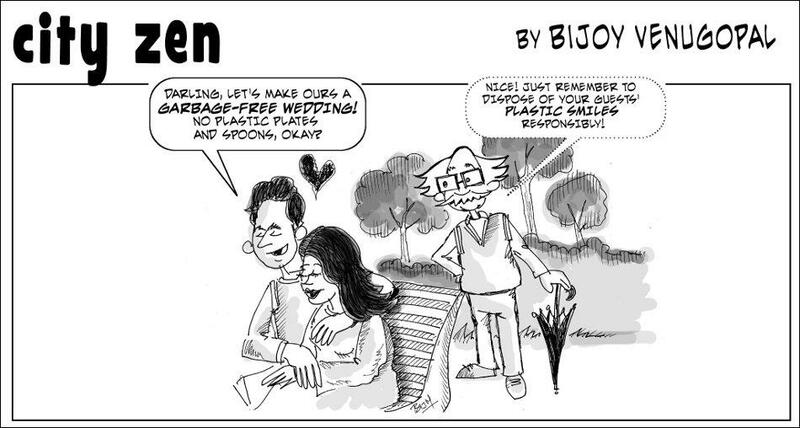 In November 2010, I began drawing a fortnightly pocket cartoon for Janaagraha’s citizen-facing portal, iJanaagraha.org. It was called City Zen and it ran very briefly — all but seven episodes were published before the portal was taken down. Unfinished business can whet a strange kind of appetite. I loved the idea of a strip that mulled over city-specific issues, though, and I’ve been thinking of reviving it — for my own pleasure. Two characters were central to the strip — an elderly, bespectacled gent (whom I modelled on my late grandfather — except my grandfather preferred a crisp white mundu to trousers) and a young woman who could be his daughter or daughter-in-law or niece — or whoever he could have a sane and sensible conversation with. So here he goes again! Garbage has raised a huge stink but we’re still obsessed with one end of the problem alone — that of disposal. Maybe we’re staring at the wrong end. Turn your attention to how garbage is generated. Or, to skip the cop-out passive voice, how we *generate* it. Consider the average restaurant or takeaway eatery and imagine the waste it generates each day. Plastic bags, plastic bottles, polystyrene foam cups, plastic spoons, plastic plates, plastic trays. This is waste we pay for — first at the point of purchase and then at the point of irresponsible disposal. Plastic cups and spoons from office cafeterias fill up landfills by the ton every day. Cups and bowls made of polystyrene foam and thermocole — both materials that take aeons to degrade — are also in the mix. At south Indian weddings, giveaway coconuts and betel leaves are wrapped lovingly in low-grade plastic bags or cellophane wrappers, which guests fling away without a thought. Then there are flex banners and posters, some of which are reused but most of which eventually end up in the dump with little chance of degrading during our combined lifetimes. So, this being the wedding season, I happen to attend some and overhear plenty of conversation about them. Let’s just say something I overheard triggered this one. Enjoy!